"Honestly, who cares? I can't trust my feelings." Starz Media & Orion Pictures have released a trailer for the comedy My Blind Brother, about a romantic rivalry between two brothers. Adam Scott stars as the more handsome, athletic sibling along with Nick Kroll as his brother who has always been by his side most of his life. They both fall for the same woman, comedian powerhouse Jenny Slate, causing some chaos that leads to shenanigans which is meant to make people laugh. The cast includes Zoe Kazan, Talia Tabin and Charlie Hewson. While this doesn't look as bad as it sounds, it doesn't look that great either, with a few sparse moments of genuine comedy amidst some awkward scenes of cheesiness. At least it has Jenny Slate. Bill (Nick Kroll) has always lived in the shadow of his brother Robbie (Adam Scott), a handsome athlete and local hero who happens to be blind. Their sibling rivalry reaches a fever pitch when both men fall for the same woman (Jenny Slate). My Blind Brother is written and directed by English filmmaker Sophie Goodhart, making her feature directorial debut with a feature version of the short she directed in 2003. The film first premiered at the SXSW Film Festival earlier in the year; it also played at the Tribeca, Seattle and Nantucket Film Festivals this year. 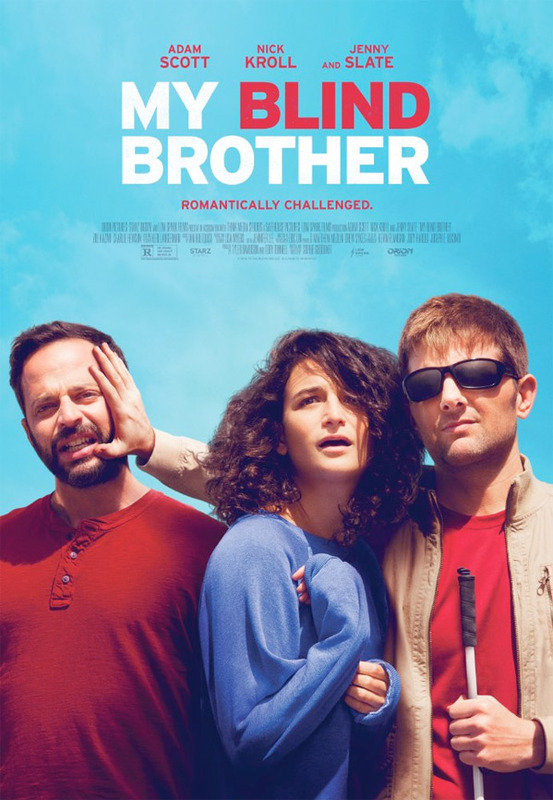 Starz Digital Media will release Sophie Goodhart's My Blind Brother in theaters nationwide + also on VOD starting September 23rd. Anyone interested in seeing this movie? Nick Kroll his hilarious. We are all entitled to our own opinion. I love Kroll in The League, but I watched a stand-up of his and couldn't even finish it.